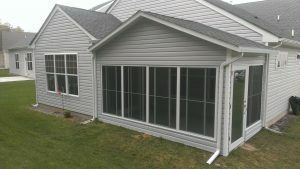 Screen rooms are the ideal home addition for homeowners in Willow Grove, King of Prussia, and elsewhere in Pennsylvania who want to enjoy the beauty of the outdoors without worrying about harmful UV rays, inclement weather, or being pestered by insects. If you’ve decided to make this investment in your home, SRA Home Products is the company to call. Our family-owned and -operated company has helped countless homeowners enhance their properties with screen rooms since 1988, and we can do the same for you. At SRA Home Products, we’ve built a reputation for providing products that exceed the expectations of the homeowners we serve in Willow Grove and King of Prussia, PA. We install Ultimate Screen Rooms from the highly regarded manufacturer TEMO, and they come with numerous impressive features. For example, our screen enclosures are constructed of heavy-duty aluminum that will stand up to a lifetime of exposure to the elements. And, their solid thermal roofs deflect heat, helping to maintain a cool temperature during the scorching summer months. If you would like to learn more about the screen rooms that we install in Willow Grove and King of Prussia, PA, contact SRA Home Products today.